Custom Traditional Arch Address Plaque - - 15" x 9.5" arch shape metal address sign holds the house number and street name you supply. Made in USA. Mount on a wall or fence post; or lawn mount. Four holes are drilled and tapped in the back of the metal plaque to accommodate threaded studs. Address number line holds up to four (4) 4" large numbers. Street name line holds up to sixteen (16) .875" smaller characters. 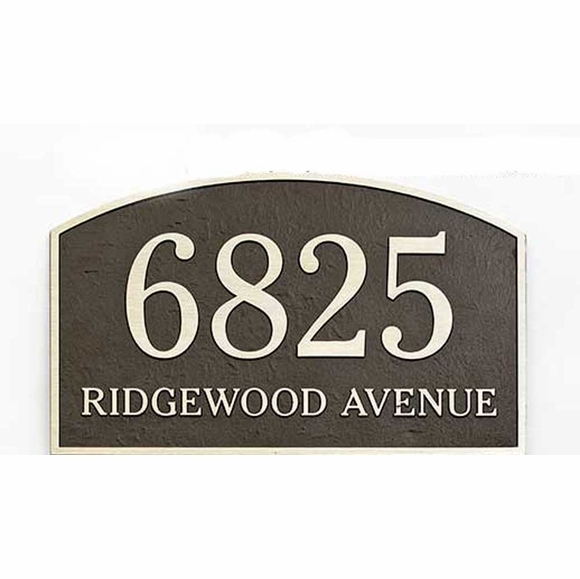 Address shown on sample above: 6825 RIDGEWOOD AVENUE.